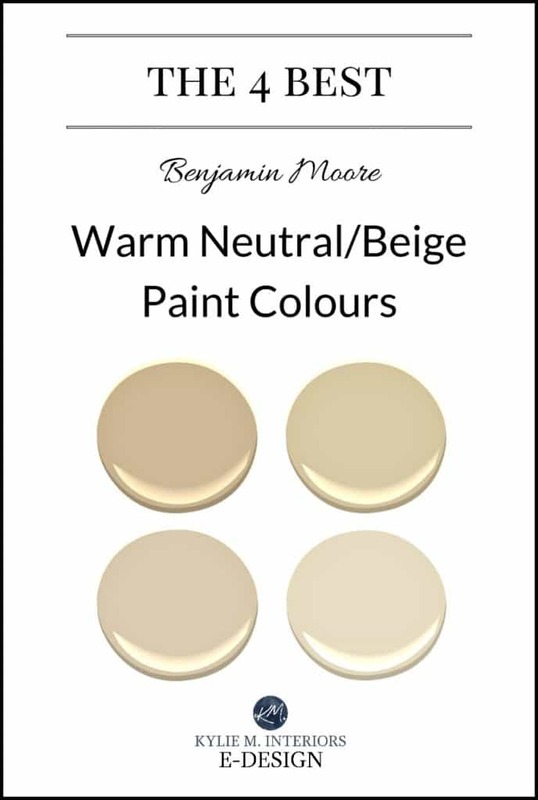 While the gray/greige paint colour trend just keeps growing, I have a loyal group of readers who just LOVE their warm paint colours – my Mom included! Now warm neutrals can be tricky as the undertones aren’t always noticeable at first glance. 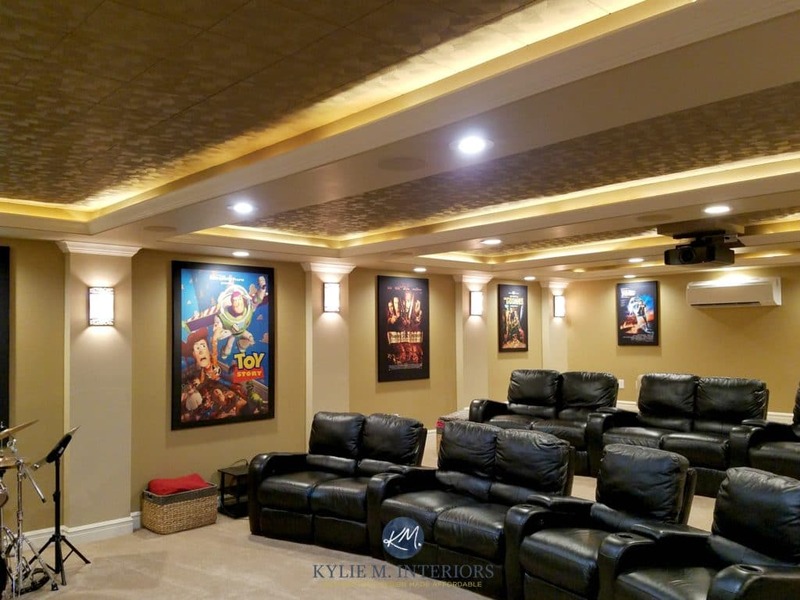 Sometimes it’s not until you get your walls painted that you discover that your neutral…ain’t so neutral! 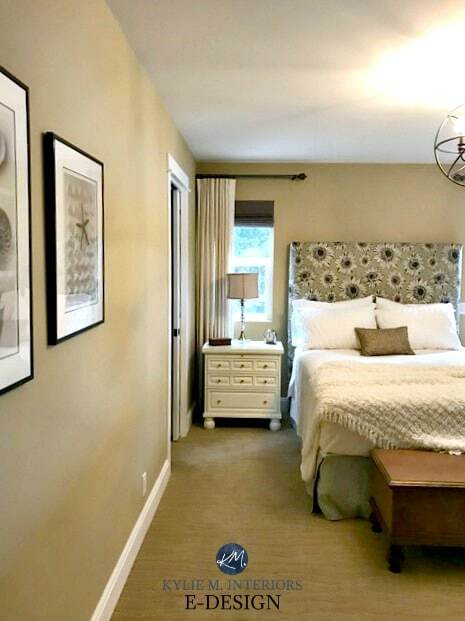 What rooms are warm neutrals especially great for? 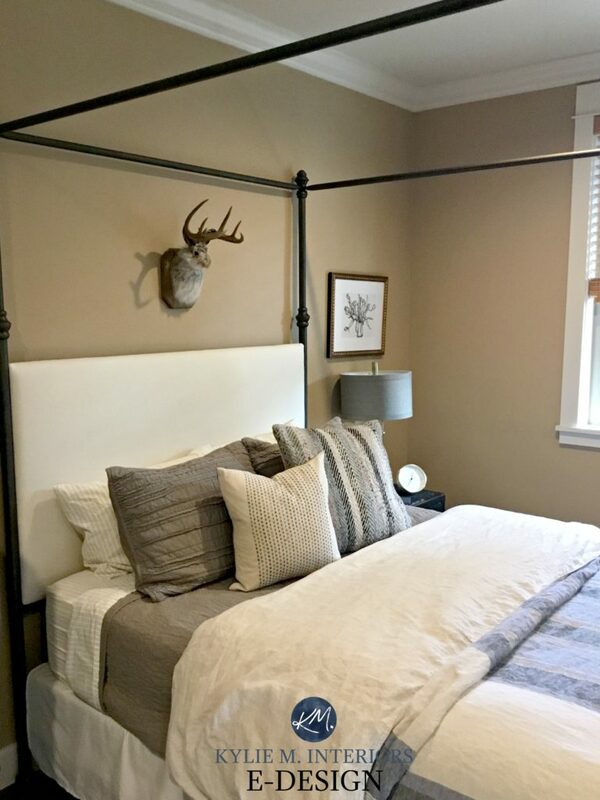 Well-balanced warm neutrals will help to balance out the visual temperature of the room and can work well for particularly dark and heavy rooms. However, keep in mind that north facing rooms have a cool, almost blue/gray natural light which can react with warm tones that have a lot of yellow in them. This can create a subtle green when mixed (which is why your warm neutral should be well-balanced). If you have excessive greenery that reflects green into your space then warm neutrals can help to balance the visual temperature. Lenox Tan is a warm neutral that I use often as the visual weight and the warmth of it seems to work well in so many rooms! Lenox Tan has a grounded golden undertone, meaning it’s a yellow/orange blend. 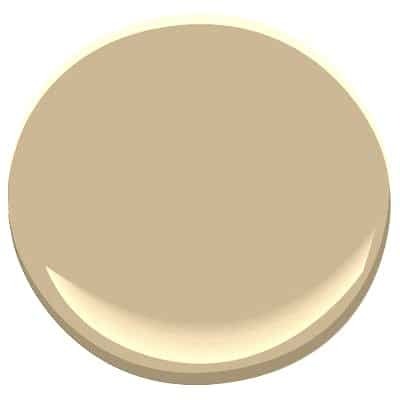 Monroe Bisque is a warm beige with a subtle yellow undertone. It is a pretty typical beige – or what people expect beige to look like with regard to overall colour and depth. Palm Desert Tan has a bit more depth than the others, and I LIKE it. It has such a nice balance of warm undertones, leaning more into the orange than the yellow/red. If you want a warmer beige WITHOUT yellow, then this one could do the trick! Thousand Islands is a warm beige without the yellow that you’ll find in Monroe Bisque, but keep in mind that means your undertone options are orange or red – and you’re looking at orange with this bad boy! If you want warm, but not yellow – this could be a great option! Not sure which beige is best for you? Check out my affordable Online Color Consulting and Design Services! I would like to hire you for my paint selections and furniture placement and purchase. Sounds great! I’ve replied to your email and referenced you to my Online Consulting, I hope to hear from you! Hi Lynda, I’m so glad you’ve mentioned these colours. I do love them and have used them numerous times. In the world of warm neutrals, Thousand Island and Moccasin are into the peach end of things. The certainly aren’t peach, it’s just that the undertone in them (being more orange) sits in that range, compared to some of the more ‘yellow’ undertones – which seem to be the most popular these days. Moccasin is a bit more ‘fresh’ than Thousand island, whereas thousand Island is more grounded (although they are both grounded colours). Moccasin might be better in a basement, just because of the freshness of it, whereas Thousand Island might fall a bit flat – depending on how your natural and artificial light is. Help!!! Just painted my house bleeker beige – looks good in the day – but looks too green at night. I’m looking for a warm greige ( more beige then gray ) – my house faces north and has lots of “warmth” in area rugs, curtains, couch etc. HELP!!! pleas need a recommendation, thank you in advance. Debbie, thank you SO Much! And hey, where do you live? I know Hawaii is a big place, but we are heading there in 3 weeks – to Kihei, wouldn’t that be something if you were close by????!!! As for warm beigey golden paint colour, BM Muslin is a nice one as it SW Wool Skein (which can pick up a subtle green) or Softer Tan which is lovely and warm. Anyhoo, Aloha to you too! I am struggling with picking the paint color for my living room. I have clay/grew brown new carpet, milk chocolate brown sofa, royal chestnut hallway laminate flooring, and most important I have 2 walks done with oak paneling (the whole walls). 99.9% of people say I should get rid of the pine. But it was my mother’s house, and although I’ve changed 90% of the house, there are a few sentimental things that I refuse to change and one of those is the 2 oak walls. Many people call me slightly color blind. I know what I like but sometimes I go slightly off the track. I picked out paint for my bedroom once and I thought it was neutral but it turned out to be very ORANGE! YICKES! I love the Monroe bisque. However, friends, family and store clerks at paint stores says its a no no. And that I should stick with more darker beige neutrals. But I love paints with a hint of yellow and brighter. What should I do? Hi Judy, well I’m SO glad you aren’t getting rid of those walls, thank you. It is just so important that your home is your happy place. I have bits n’ pieces ALL over my home that don’t always fit in, but i don’t care because when I look at them I feel good, i feel my Grandpa or my Grandma or whoever it is that I’m missing. Anyway, you’re going to make me tear up here. So, I see (well I don’t see as I don’t have photos) but in my MINDS eye, I see ZERO problem with Monroe Bisque. Why? Well, if you go to a darker beige neutral, it will start to blend in with the panelling. Monroe ‘should’ be enough to sit off of it slightly. Also some beige’s start going more orange toned. If your pine is on the more yellow side, this can be a hot mess, which is another reason why Monroe Bisque could work – it IS more yellow base. Here’s what I say. Friends opinions are important, but they are almost ALWAYS based on their personal preferences. Someone like me can step back and take my personal taste out and put what YOU need in. And what I’m saying is ‘YOU GO GIRL!’. Help! I LOVE your blog and have learned so much from your articles, thank you. I bought pale emerald and old gold curtains and am really struggling to find paint colours to go with it. My room faces north with a dark dining ng room alcove at the end of the room. What colour can I use that picks up the old gold instead of the green and is warm? Have tried BM Waterbury cream but it looked too yellow in the light. Thanks Kylie. When going with the warmer shades of wall paint, what are some good options for the trim? I don’t like true white as I feel like it with my warm fabrics and accessories. Thank you. BM White Dove and SW Alabaster are both pretty, warm whites to start with! You may never see this, but what do you think about Putnam Ivory in a North Facing room? Hi Jason, I like that idea! 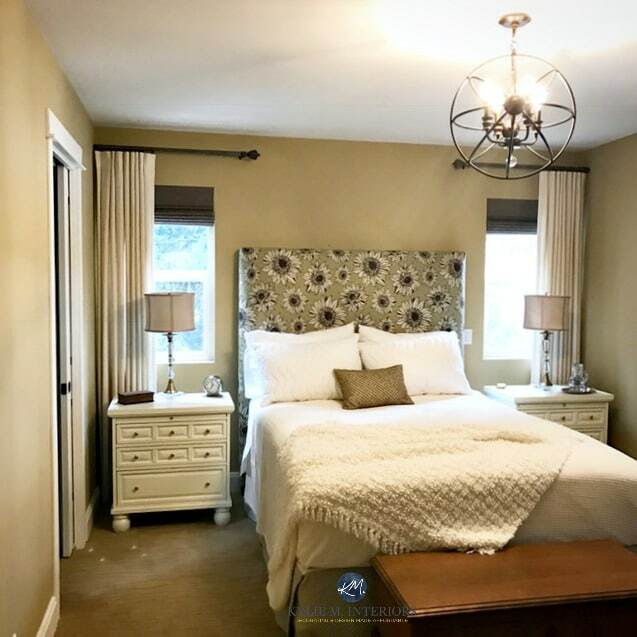 Actually I just posted a photo on my Instagram of Putnam Ivory in a client’s home and it MIGHT even be a north facing one, you should check it out!